“Tell me about your strengths.” We are all familiar with this often-dreaded interview question. Even if you happen to avoid it in an interview, any complete performance review will force you to confront this question and discuss your strengths. But why? Do your strengths really matter? Is it even possible to self-assess your strengths? Empirical research answers with an unequivocal YES. As a graduate of the University of Pennsylvania’s Masters of Applied Positive Psychology program, I’ve followed this research for eight years. I find three themes from the research to be highly relevant to leadership development efforts: 1) The ability of leaders to leverage strengths is critical. Awareness of how skills match strengths and how to leverage strengths as motivators provides high return on effort. 2) Skills are important, but approaching your tasks by capitalizing on your strengths will get you further. 3) High performing teams focus on developing positive relationships, positive communication, and a positive work climate — matching strengths with goals fuels this positivity and performance. So why do so many of us fall short in applying our strengths? Because knowing your strengths is not the same as using them. When taking a strengths assessment, most of us briefly reflect then think we’re done. We don’t put our strengths to work, so we never reap the rewards of deliberate, ongoing action. To help you move beyond the threshold between self-awareness and action, here is an overview of a strengths-based, ongoing team development activity we’re doing at Blue Garnet. First, a little background: we have been experimenting with and learning from a variety of strengths tools since 2008 (half our company’s lifetime). As a professional services firm, we need exceptional talent to provide exceptional services, so we take individual and team development very seriously. We began by testing two tools: the Values in Action character strengths assessment and Gallup’s StrengthsFinder. We use these resources for hiring, for team building, and with clients for coaching, strategy retreats, leadership development workshops, culture assessments, etc. Recently, we dug into our collective strengths to better understand how our individual roles sustain a culture of learning and growth. We believe that shared leadership and collaborative learning (one of Blue Garnet’s values) are linchpins to sustaining a positive firm culture – so off we went! Instead of revisiting our results from Gallup’s StrengthsFinder, we experimented with Marcus Buckingham’s StandOut assessment. StrengthsFinder identifies your top five talent themes, whereas StandOut identifies two primary roles that will make you most effective at work. Buckingham helped develop StrengthsFinder and his StandOut tool lists predictive “talents” for your two roles, many of which are similar to the StrengthsFinder talents. We appreciated this overlap and used Buckingham’s new tool to build on our previous learnings. After individual StandOut assessments, our team gathered for three “workouts.” We use the term workout to emphasize that these assessments aren’t prescriptive; they require us to identify, discuss, and work out what these strengths and roles mean, individually and as a team. Workout #1: Strengths Refresher. First, we discussed our strengths-based philosophy and reviewed how we apply positive leadership practices to our work. Then, we went over the StandOut tool and discussed our individual roles, what our commonalities are, and where we differ. Our “homework” was to use two worksheets throughout the next few weeks as practical, energizing ways to deepen our individual understanding of our strengths and roles in action. Workout #2: Team Mapping. Using a visual map of our roles and strengths, we had a reflective conversation on questions such as: Where do our roles and strengths intersect? Where do we balance each other out? Are there gaps on our team? How does our unique mix of strengths factor into our culture and the “feel” of everyday team life? As homework, we gave 360º feedback to every team member on what contributions we value and what we need from each other, looking forward, to achieve positive deviance in performance. Workout #3: 360º Feedback. We each shared our thoughts on the (confidential) feedback we received, leading to a rich conversation about our roles and team contributions. Then, we shared examples from the feedback where we observed our firm values in action. We learned what our values mean to each team member, where we have alignment and strong evidence of values in action, and which values may be underdeveloped or difficult to put into action. Each individual then crafted commitment statements, which are critical for taking action, fostering positive energy, and enabling successful growth for our team. Positive, strengths-based leadership has demonstrated improvement for many organizational outcomes, such as profitability, productivity, quality, innovation, customer loyalty, and employee engagement. There are a variety of assessments and tools to choose from, but I’ll let you in on a secret – the tool you use is far less important than what you do with it. It’s all about execution and making your learnings stick. 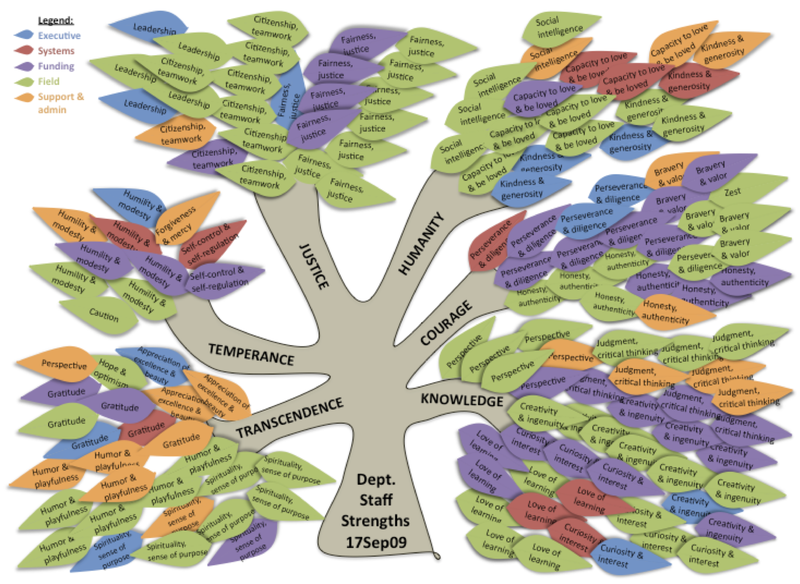 For our clients, strengths-based tools and techniques have been instrumental in facilitating complex organization-wide conversations, improving talent development practices, managing culture change, and growing well (see a sample strengths tree to the left). For our team, continuous strengths-based learning improves our communication and the way we work together, encourages ongoing professional development, and serves as a lens for how we approach tough questions and solutions. As a ‘learner’ strong in ‘futuristic’ and ‘maximizer’ strengths, I confidently believe these exercises drive our team’s excellence. We hope you enjoyed this peek into one of Blue Garnet’s ongoing firm development practices. Please let us know which strengths development tools you find most useful, and what has worked best for building your team’s culture. And of course if you have any questions, email us at hello@bluegarnet.net!